NPS Museum collections home pageWith 32 million cataloged objects, the scope and size of the National Park Service collections is extraordinary: archeology, art, history, and ethnography objects, biology, paleontology, geology specimens, and historic photographs. 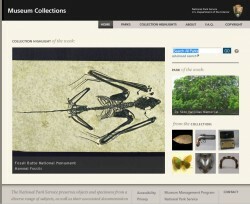 The online collection, representing a small spectrum of these holdings, was significantly redesigned in 2011 to increase visibility and showcase the collections as a tool for educators and park visitors. 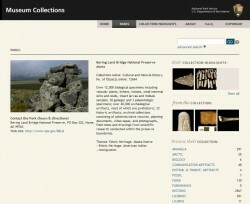 Collection Highlights: This organization system allows parks to create thematic groupings of objects representing a particular theme (ex: items related to children), a type of object (ex: painting) or simply items related to a particular location or place. By allowing the parks to develop these particular collections they can put forward their stronger or more engaging collections which may not be available, or even known, to the public. Additional Media: Each park may now upload multimedia that adds further contextual understanding to an object. Oral history files (audio), video, and related PDF documents (such as Finding Aids) enrich the object’s story. Search Queries across Disciplines: The search engine allows queries across discipline for all (and individual) parks as well as being able to search the park summaries and collection highlights, using the same powerful search engine as the cataloging software. 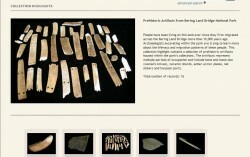 But the site also strives to suggest objects through an “of the week” feature, suggested highlights and objects on the park pages, and quick search links. Park Database: providing information on the park location, range of collections, online exhibits and other online resources, and easy access into objects. Streamlined Interface: The overall design of the site respects the umbrella brand of the NPS while creating specific focus on the objects available within the collections. The home page provides a suite of rotating imagery that updates every week to bring forward much of the rich content found throughout the site. The search results and article detail pages were all designed to best support the intended function of the user, eliminating any perceived superfluous content that may interfere with direct access to the object. The challenge of this redesign has been multi-faceted. To design a site that allows users to gain understanding of the catalog depths from the home page while answering questions of a researcher looking at maritime history, to the casual visitor curious about the history of the Florida parks. It’s about seeing the objects not just as individual things but as part of a park, a collection, a historic theme, or an aspect of the rich cultural and bio-diversity of the United States.